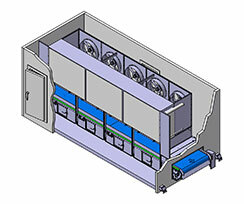 The Scanico Belt Freezer (SBF) is highly suitable for freezing of diced meat products and other similar small products. Upward vertical airflow in combination with belt tumblers creates a gentle turbulence in the product layer, ensuring a high-quality IQF product. In-feed and out-feed positioned at floor level of the Scanico Belt Freezer allows for an easy transfer from/to further processing lines.